About once a month my PCV neighbor and I plan an outing or fun activity together. We have gone hiking, made natural beauty products, and often cook fun meals from scratch (which includes doing most of our own food processing). One time pizza was on our menu. Though we could make the tomato sauce and bread from scratch with no problem, the cheese proved to be a real challenge. Even when we followed the most basic recipes on Google the cheese we produced was mediocre at best. But cheese exists here too. It is made by one of the world’s largest (some say the largest) nomadic people called the Fulani. They walk throughout West Africa, and while they keep their baggage light, they bring hundreds of cows along with them. Consequently, the towns they pass through get fresh milk and cheese access. 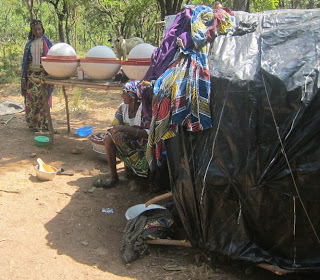 To make cheese here, we knew the Fulani had to use basic, easy to find ingredients. To find out their secrets, we scheduled an outing to where they live. However, because they have so many cows, their camps are in the farthest, most remote locations. To get there involved a 15-20 kilometer motorcycle ride outside the city limits on an extremely bumpy road. 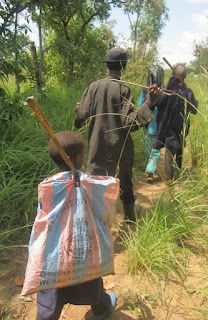 Then we walked another 2-3 kilometers so far en brousse, in the bush, that we assumed we were lost. We were not lost. This is where the Fulani lived. There were about 50 people at the site, a simple camp area. The space was not cleared—we were still in the middle of nowhere. Yet, it was a great place to be. Aside from being secluded it was well shaded and quite verdant. The first thing we noticed were their tents. They can be more accurately described as thick black plastics covering a bed. Their bed being a mat elevated by a few logs. That was it. And each person kept their possessions few, with nothing larger than what could fit in their roughly 5’ by 3’ tent. This was just my first, quick observation but within minutes I was presented with another. 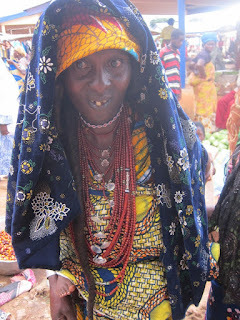 The other PCV and I were approached by the beautiful faces of Fulani men first, then the older children. 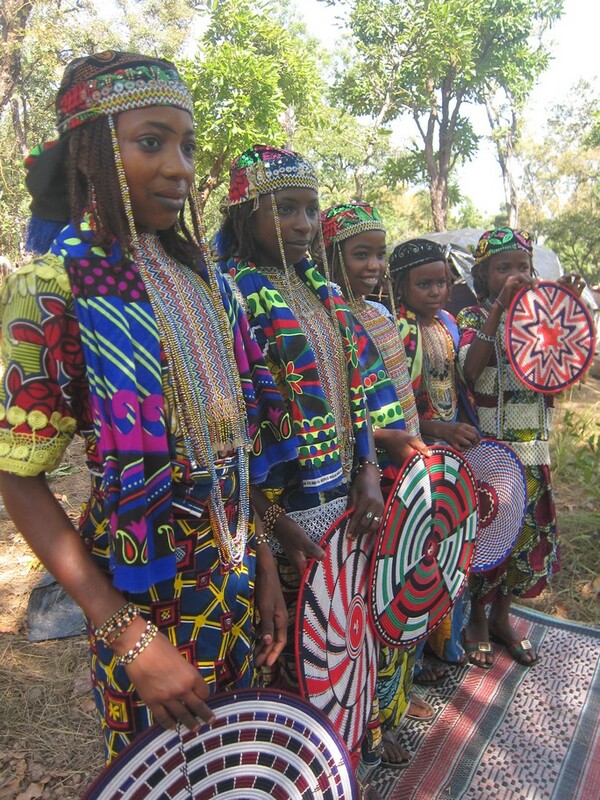 Their characteristics contrasted many of those in the Togolese. They walked toward us in their slender bodies with pointed features, facial tattoos, and brightly colored clothes and jewelry. We stayed with the men for a few minutes but quickly ventured off to see the women. There, we found the youngest kids of the group. Again, I was stunned by the beauty of this people. They often wear eyeliner (even the kids), keep their hair braided in some funky styles, (though always natural, never adding extensions), and wore brightly colored beaded jewelry. A common feature of all of the people—men, women and children was their set of big, glistening eyes. They shone with what seemed to be deep curiosity and happiness. 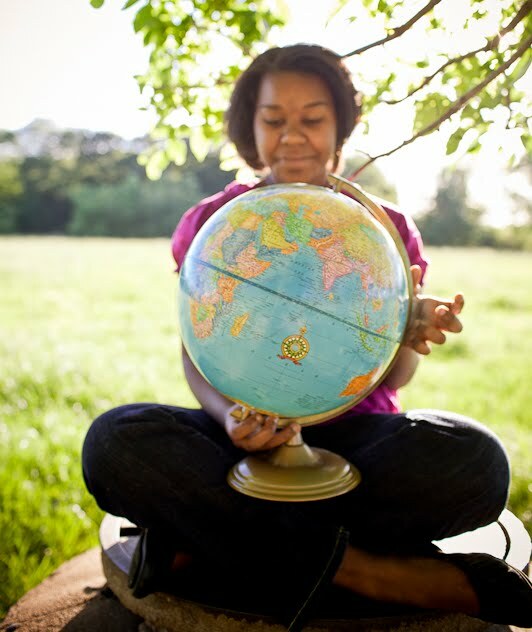 This was the Africa and the Peace Corps I was expecting to come to. Being secluded in lands quite literally off the beaten path and surrounded by such an exotic culture and language I did not understand. 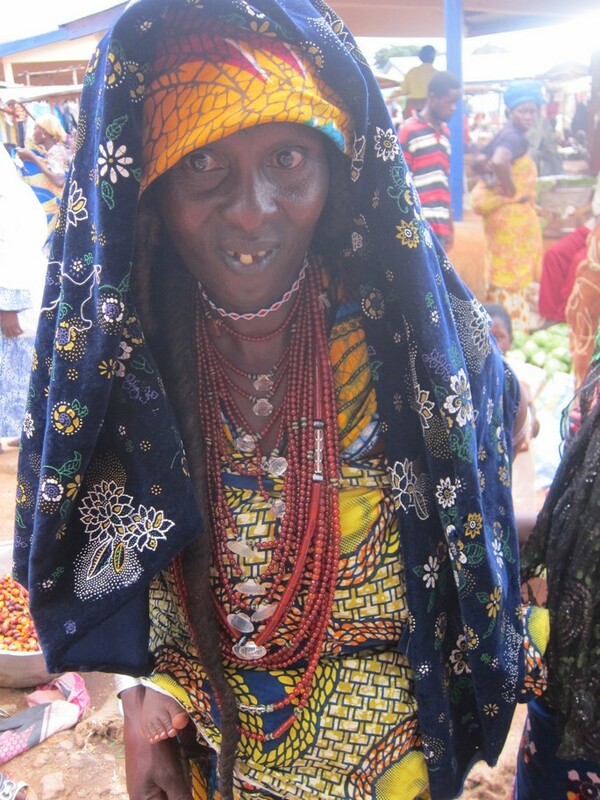 Being with the Fulani felt like I stepped into an entirely different world. In this world, living off the land and raising animals was all that concerned them. Yes, they sold cows for upwards of $1400 USD; one was sold $700 USD during our visit but that did not seem to matter much to them. What seemed more important was just living life and being around family. Simply to occupy their free time you might find them milking cows, or making cheese. Yet, this brings me of one of the battles we fight as PCVs; our push for education. During this trip it dawned on me that not a single one of these people had been to school. Many of the adults and most of the young children have never been exposed to technology outside of a cell phone (they were amazed with our cameras). One young girl was even astonished to see me drink from a plastic sachet of water I brought with me. When my young translator explained “she’s never seen it before” I stopped to inspect the area. In towns, the plastic water satchets are one of the most common pieces of litter. Here, not a single piece of trash could be found on the ground. After all, what non-compostable piece of trash would they have? The only thing littering the area were cow patties, something the Fulani seemed to simply disregard. During a conversation I tried to have with some of the kids, they listened to my French (a language they do not speak) while kneeling over cow patties and did not seem fazed by it at all. This Eden blew my mind. These people seemed to defy all the rules in life and yet they had it all. While not formal, they have a quite rich education. It focuses on the practical, useful everyday necessities of their life. Preferring what plants do what things rather than keeping up with the latest technological trends. They also know how to survive with little food or water, and have this innate ability of knowing the right direction after coming to a place just one time. Plus, they had 100% freedom and more money than they could ever need. They just pick up and go for months, or years at a time. The only things they discover in their paths are willing cow, milk and cheese buyers. Even at the end of my trip, I never figured out what they do with their money. They make enough from one cow to purchase a motorcycle or cheap used car (and they have herds of 200 cows or more). However, they choose to keep their wants and needs few. After all, who would want to carry any extra stuff for such long treks? I pondered this throughout our visit but most as we were find our way out. How many more of these places exist in the tiny Togo? I wondered. Then before too long, we arrived at that bumpy road we came in on. 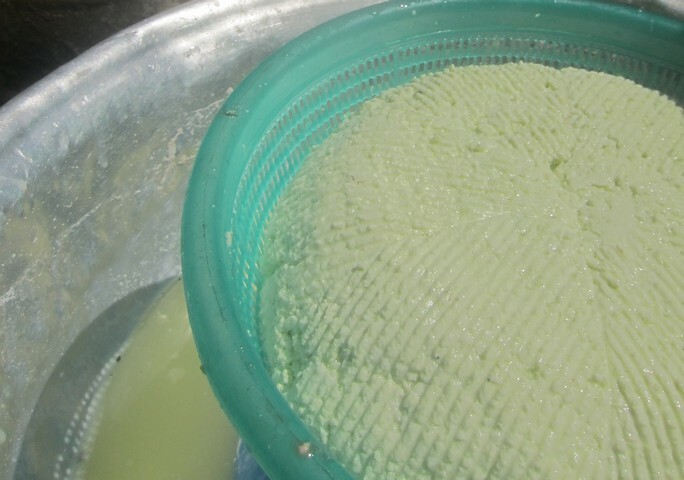 The midday heat struck me as if to say “welcome back to the real world.” The only proof I have of seeing the Fulani world with is my new cheese making skill.